Building A Shed . . . .
My old shed (which you see pictured to the left) has served me well, but it is somewhat leaky and not really that solidly built. It's basically galvanized metal on one side, scrap siding on the other. Also, it just has one electrical line running from a kitchen circuit, so whenever I start a power tool, the lights dim! So....after much research and many estimates, I decided to have another shed built in the back of my long backyard lot. The brick corners you see way back there kind of mark the spot where the shed will be put. I'm going to have a shed built from the ShedShop. It will be 10' by 12' and will have a subpanel in it, run from my main house panel. I will also have a proper line run from that subpanel to the older shed. I plan to use the older shed for assembly and storage (which I had little of before). The newer shed will have just enough room for my stationary power tools --- my 14" bandsaw, DeWalt bench table saw, 4"/6" belt & disc sander, little 1"/4" belt and disc sander, router table, miter saw, and 12" drill press. I will feel much better with all those tools in a solid, leak-proof, and properly wired shed!!!! I plan to put insulation and drywall in myself (I've always wanted to try that after seeing it done all the time on "This Old House"!!! ), and, of course, paint it all. It should be fun. Monday, June 23rd, 2003...... 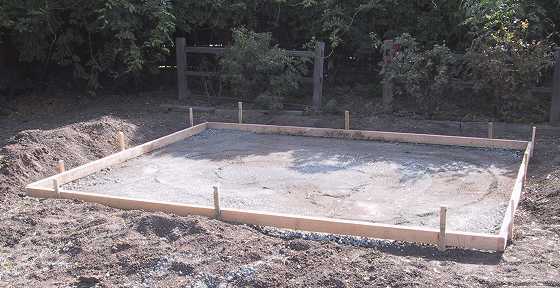 The concrete guys came today, graded and leveled the ground for the concrete slab I am having done for the shed. 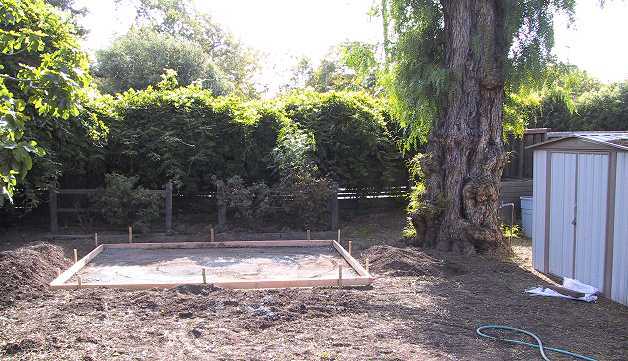 Tomorrow they will put more gravel in and compact the base some more, before pouring the concrete for the 4" slab.